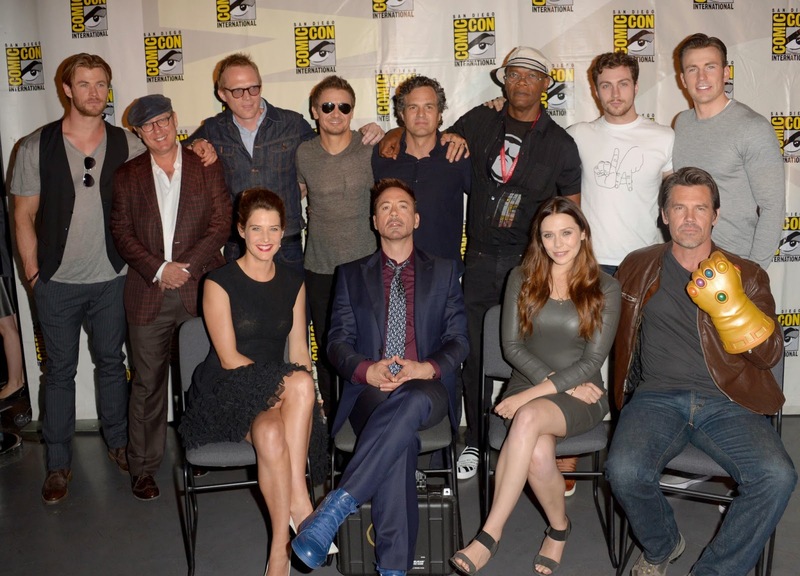 El panel de Marvel Studios era el más esperado de la convención porque tener juntos al plantel de intérpretes siempre supone una atracción. Viendo solo los primeros instantes ya nos podemos hacer a la idea del simbolismo del evento. Solo hubo dos ausencias destacadas: la de Joss Whedon, debido a una intervención de rodilla, y Scarlett Johansson, en avanzado estado de gestación. Pero allí estuvieron el "entertainer" Robert Downey Jr., Jeremy Renner, Mark Ruffalo, Chris Hemsworth, Cobie Smulders, Samuel L. Jackson, Chris Evans, y las nuevas incorporaciones a la familia de los Vengadores: Elizabeth Olsen (Bruja Escarlata), Aaron Taylor-Johnson (Mercurio), y Paul Bettany (Visión). También estuvo presente James Spader, quien presta su voz a Ultrón. Y, casi al final, apareció Josh Brolin, que interpreta a Thanos a partir de Guardianes de la Galaxia. We start on a city scape and the whole team is assembled in Avengers tower. They’re all hanging out. Drinking beer, joking, and Hawkeye tells Thor the whole no-one-can-grab-the hammer thing is “a circus side show.” He disagrees and Stark tries to pick it up. “If I lift it do I get to rule Asgard?” he asks. Yes, Thor says. He fails on a first attempt. “I’ll be right back.” He puts on the Iron Man glove. No dice. He and Rhodie try, both in their Iron Man gloves. Nope. Hawkeye fails. Banner tries and really exerts himself. Everyone gives him a look. Next up is Cap and he budges it which really gets Thor worried. However, having all failed Thor says he has a simple theory “You’re all not worthy.” Just then a huge screeching sound. “You’re all not worthy.” Enter a brutally broken, almost zombie like metal being. It’s Ultron. “How could you be worthy? You are all killers. You want to protect the world but you don’t want it to change. There’s only one path to peace… your extinction.” Just then a bunch of other robots fly in and we get the Marvel Studios logo. Ultron continues in voice over with a bunch of other images. “I had a vision … the whole world screaming for mercy.” People running away, escaping. “Everyone tangled in strings.” Banner all sickly looking on a place. “Strinnnngs.” Massive battle scenes, Hawkeye and others helping people evacuate. Banner in the snow, then a random hospital, Scarlet Witch on a bus, Thor smashing a tank. Then Tony Stark “It’s the end,” he says. “The end of the path I started us on.” Widow adds, “Nothing lasts forever.” We then see a screaming Hulk and the massive Hulk Buster armor. Black Widow on the Harley Davidson, Quicksilver running around, Andy Serkis as a human (!?! ), more explosions, Iron Man flying by what looks like a prison and shooting some soldiers. Hulk throws a car at the Hulkbuster and then punches him through it. A quick shot of Widow and Hulk almost touching hands. The whole time, a song has been playing about strings. It’s very eerie and morbid. Finally, we get a fully realized, metallic, 8 foot Ultron. Referencing his statement “There are no strings on me” as his clenching fist turns into the circle around the “A” of “Avengers: Age of Ultron.” The title card. Then, after that, we see Cap’s shild broken, Tony Stark looking down at it, the camera pulls back and we literally see every member of the team laying on the ground in tatters on what may or not be Thanos’ tomb. They look dead. La presencia de la Visión en la película suscita mucho interés y más sabiendo que es Paul Bettany quien la interpreta. Bettany había sido la voz, hasta ahora, de Jarvis pero está claro que Joss Whedon ha previsto varios cambios en la nueva entrega. Quizá uno de ellos sea que Tony Stark ha sido capaz de crear un Jarvis holográfico de apariencia humana. Bettany confirmó que los poderes de cambio de densidad, tan característicos de la Visión, se mantienen en el film. Pocos detalles más fueron revelados. En cuanto al calendario de fechas previstas de estreno en las películas Marvel, Feige solo confirmó la secuela de Guardianes de la Galaxia. Verá la luz el 28 de julio de 2017 y James Gunn seguirá siendo su director y guionista. Nada sobre nuevos proyectos de la casa. Se hablará de Doctor Extraño más adelante. The clip opens on a science lab. In contrast to the super-sleek ones we’ve seen at, say, Wayne Enterprises or Stark Industries, this one looks older and smaller, almost homey. The camera moves around the room, showing various flasks and vials, a jar with moving ants inside, and Ant-Man’s famous helmet. Pym makes it clear he doesn’t hold superheroes in high esteem to begin with. “You’re not an egomaniac,” he agrees. “Superheroes, what a goddamn joke.” Pym continues confidently over Lang’s protests. “I think someone already shrunk your balls,” he says. “It’s a small job. The video then cuts to a city at night, with flashing lights and tall buildings in the background. We see a tiny figure in the Ant-Man suit, running across a rooftop. It’s Scott, and we can hear him speaking to Hank remotely. It sounds like Scott is on his first adventure, and Hank is instructing him in what to do. A flying insect flies toward Scott and he tries to get on, but the damn thing won’t budge. Hank tells Scott to just jump, so Scott launches himself off the building… and he’s immediately caught by a flying ant. Scott rides it through a vent, as other insects follow. “Okay. I got this,” Scott says. AVENGERS: THE AGE OF ULTRON - "You are all killers. You want to protect the world but you don’t want it to change. There’s only one path to peace… your extinction.” Por el momento, lo que se nos cuenta, capta a la perfección la esencia del personaje. El cambio y el camino de la paz no son más que vanas palabras para lo que realmente quiere ULTRON, que no es otra cosa que el exterminio de la raza humana. También haciendo incapié en THOR, dado que es un ser mitológico lo detesta especialmente al carecer su existencia de base "científica o lógica". Hank Pym es Ant-Man, Giant Man y Yellow Jacket. Distintas identidades de un mismo hombre. Scott Lang toma la identidad de Ant - Man tras dejarla Pym por una identidad civil (creo). Darren Agonistes Cross es el CEO de Industrias Tecnológicas Cross una empresa ficticia en el Universo Marvel. ¿Hank Pym, con una hija? ¿Y quién es su madre, Janet Van Dyne o María Trovaya? Que se sepa, Hope Pym es su hija en MC2 (un universo paralelo).